Imagine cloudless blue skies, quaint century-old villages, hillsides dotted with blue-trimmed, whitewashed houses and gnarled olive trees. Imagine friendly people, gentle breezes and safe swimming beaches each with it’s own family-run taverna. This is the Cyclades. This is Paros. The Cyclades islands lie in the Aegean southeast of mainland Greece. Including such well-known locations as Mykonos and Santorini, these islands are impossibly beautiful throughout the year. Paros, a lesser-known island to international tourists, is an undiscovered gem in this chain. Famous since antiquity for translucent marble, Paros was once a Venetian client state, later a property of the Ottomans, but also home to a heroine of the Greek nationalist movement. 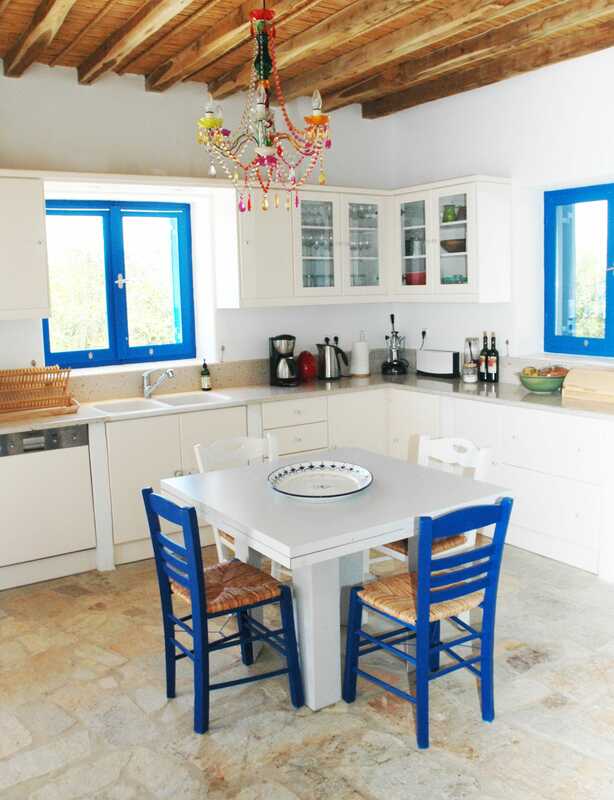 The Olive House is a superb location from which to savor and enjoy Paros. The house sits on a hill on the south-east corner of the island, overlooking the smaller Antiparos. From the expansive patio at the front of the property guests have sweeping views of the surrounding area, framed by the olives and vines in the garden below. The property has a large central living area, a large kitchen, three comfortable bedrooms, and multiple outdoor seating areas. One of the rooms is furnished and organized for children, an unexpected but welcome treat for my visit with my three-year-old nephew. Two of the bedrooms have an ensuite bathroom with shower, the master suite includes a sunken bathtub. Make a request from their page and CB! Vacation Consulting will help. This is a free service! Your hosts at the Olive House have gone out of their way to think of everything that a vacationing family might need to make a rental property feel like home. On the day we arrived, the kitchen was pre-stocked with bread, milk and eggs. There’s a kid-friendly dishes and a water-cooler in the kitchen, so potable water is not a concern; there’s a well-stocked first-aid kit too. Ramona, the on-island (and local) hostess, is a treasure. I honestly wish that every vacation property I rented came with a Ramona. She offered much of her time and knowledge about the island to help us settle in and to advise on what to see and do. The Olive House is located just above charming Aliki, which has a family-run taverna serving excellent food and a secluded beach — with a playground! A short (12km) drive will take you to Parikia, the main town on the island from which ferries to Athens and other islands arrive and depart throughout the day. The tiny airport lies below the house. Watching the propellor planes take off and land was a high point of my nephew’s vacation. There are many family-friendly beaches on Paros offering everything from kid-friendly paddle-boats (at Monastiri) to world-class windsurfing (at Golden Beach) and everything in between. Thankfully you won’t need to find your way through rows and rows of sun-loungers on these beaches! When Ramona greets you she will offer to show you the grocery stores in Parikia and she includes restaurant recommendations in the information she prepares for your visit (customized, based on your group interests and needs). Paros is a small island (21 km long), so if you decide to eat out, you can really choose from any of the restaurants on the island. Personally, my favorites are the fish restaurants along the harbor in Naoussa, where you can eat like a local and enjoy the vibrant sunsets. Last Minute Special: Get 10% off Summer Summer bookings! You will need a car to stay at the Olive House. There is public transportation on the island but the walk up from the main road to the house is steep and not recommended with very young children. Want Help Planning a Family Beach Vacation in the Greek Islands? We can help! CB! Vacation Consultants specialize in helping families book travel to top destinations around the world. Our expert consultants do everything from recommending and booking accommodations (including a qualified options not featured on Ciao Bambino) to developing comprehensive multi-stop itineraries that include activities and vetted guides. For more information and to request assistance, go to the CB! Vacation Consultants page. Editor’s Note: Michelle was offered a media rate to review The Olive House. As always, our opinions are our own on Ciao Bambino.